Top O’ the Bangles to Ya! If you’re a regular Stylephile reader, you’re no stranger to Alex and Ani, the celebrity-loved collection by owner, designer and Rhode Island native Carolyn Rafaelian. Alex and Ani was born out of Carolyn’s ethos to create eco-friendly pieces that enlighten the mind and empower the spirit—and pieces that are just plain fun and whimsical (read my anniversary post about the Newport Alex and Ani by clicking here). Tomorrow is Newport’s St. Patrick’s Day Parade, and if you haven’t been, it’s the City’s unofficial coming out party, a time when whether or not Mother Nature agrees, we toast Newport’s Irish heritage (and our own, as the case may be) while looking toward the promise of spring. 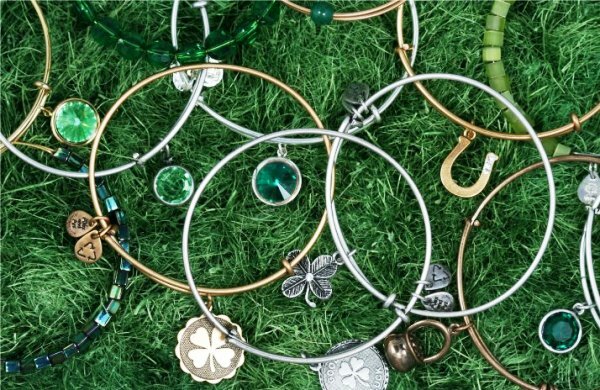 There’s a ton of festive swag to commemorate the celebration, but I’d love to sport some of the great Alex and Ani bangles above—a great four leaf clover, pot of gold, horse shoe or Good Luck charm on their signature expandable bangles. (I’m partial to the Russian Gold, but they also come in Russian silver.) Plus they’re inexpensive, starting at $21, and you can progressively add more to create a fabulous collection of stackables. 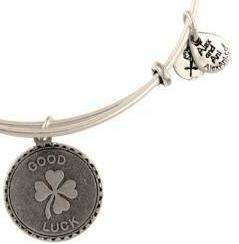 I wonder if any of Alex and Ani’s celeb fans, like Christy Turlington, Katherine McPhee, Miley Cyrus, Shakira, Ashlee Simpson (and Real Housewives Bethenny Frankel, Taylor Armstrong and Teresa Giudice) have any of these specific pieces to bring them a little lock of the Irish??? Happy shopping! Entry filed under: Uncategorized. Tags: Alex and Ani, Alex and Ani bangles, Alex and Ani Newport, Ashlee Simpson, Ashlee Simpson jewelry, Bethenny Frankel jewelry, celebrity bangles, celebrity bracelets, Christy Turlington, Christy Turlington jewelry, Katherine McPhee, Katherine McPhee jewelry, Miley Cyrus, Miley Cyrus jewelry, Newport Irish, Newport’s St. Patrick’s Day Parade, Newport’s St. Patrick’s Day Parade RI, Real Housewives jewelry, Shakira, Shakira jewelry, Taylor Armstrong jewelry, Teresa Giudice jewelry.